The family of a Detroit 8th grader says the girl was attacked on school grounds last week and that school administrators didn’t do enough to prevent it. 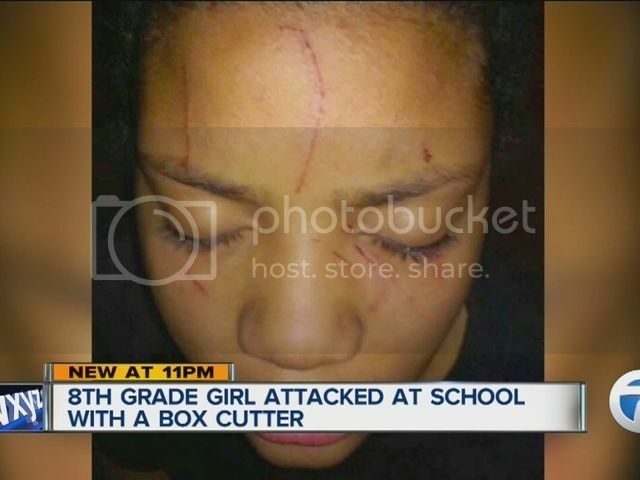 Quanaisha Allison told 7 Action News she was attacked outside Ann Arbor Trail Magnet School March 23, after she received threatening text messages the night before that said another student wanted to fight her. Quanaisha says she alerted her mother right away and they told the school’s assistant principal. A counselor met with both girls Monday morning. Quanaisha and her mother, Anaisha Chapman, said they thought the air was cleared after the meeting. But the trouble started just as school was letting out last Monday. Quanaisha says the other student approached her from behind as she was leaving. That's when Quanaisha says she pinned the other girl down to defend herself and the girl’s mother and sister then got involved in the brawl. Quanaisha said it was the girl’s sister who slashed her face with a box cutter. “Sliced up my face with a razor blade and, like, punching my face and stuff. I really couldn't see. I had my eyes closed,” is how Quanaisha describes what happened. Quanaisha’s mother arrived at school as the attack was ending. She says she saw the other girl’s mother with her hands on Quanaisha’s neck.